Great articles written by someone other than you. Every writer has read an article that they wish they had written themselves. Honoring that odd moment is Businessweek’s annual Jealousy List, a compilation of pieces that the magazine’s staffers wish they had done themselves. 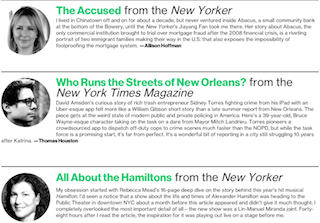 Leading the Jealousy List pack is The New Yorker, with seven pieces. The New York Times is the runner-up with six, followed by The New York Times Magazine (6) and Wired (2).